Getting Tired of Facebook? There’s Diaspora. In spite of all the complaints that people have been making about Facebook, no one can deny that it still has countless users – and it doesn’t look like the numbers are going to drop anytime soon. If you don’t have a clear idea about the numbers, you might want to take a look at Infographic Labs’ post on how Facebook is dominating the scene. However, just because everyone and their mother is on Facebook does not mean that everyone’s all happy and content about it. That’s just the thing – with the numbers involved, you can’t really expect to make everyone happy. That’s a fact of life, isn’t it? Just in case you have serious and legitimate issues with Facebook, then you just might have an alternative pretty soon, and it’s called Diaspora. With the tag line “The privacy aware, personally controlled, do-it-all, open source social network,” Diaspora is all about bringing together the users and the platform together. 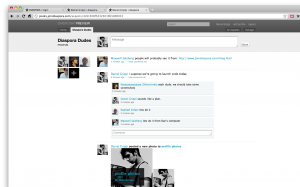 The idea of Diaspora came up earlier this year, and it immediately received a lot of attention. However, it wasn’t until last week that the brains behind the idea actually had something concrete to show. On the 16th of September, the Developer Release of Diaspora was made available. Before you get all excited and try to create an account, though, you ought to know that it’s simply for developers – people who can deal with the underlying technology. In layman’s terms, if you are a mere user (like me), then there’s still nothing concrete to be excited about. Still, once the ones who do know how to program work things out, we ought to have a safer alternative to Facebook. Don’t hold your breath, though – small chance of seeing it in a “usable” format within the year.